TAAG. was formed to improve communication between artists and art organisations and to further the Arts in the area through collaboration and mutual support. Story of TAAG Arts Action Group from 2007- 2019 – Art Strategy for Teignmouth. Open meeting to discuss Visual and performance Arts in Teignmouth on 30th November 2007 at 6-7pm at Carlton Theatre – Guest- Steve Matson-TDC Service Delivery Leader. 2007 Teignmouth Arts Advisory Group formed, with representation from Visual and Performance organisations in Teignmouth, to have a cohesive Arts policy/stategy for the Carlton Theatre development and to compensate for the loss of an Arts Officer at Teignbridge District Council. May 2010 TAAG CIC takes possession of Teignmouth Community Association (formerly Swanson’s showroom) and opens in August 2010 with an exhibition of ‘Inside Trail’. Anachronism changed to Teignmouth Arts Action Group as now have a Community Art Centre building to manage. Volunteers worked to make it immediately habitable and the improvements continue to this day. NB. The building had been used in August by TRAIL from 2007. 2010 – Advanced plans for the £7,000,000 development of the Carlton Theatre shelved due to the changes in local government from Lib Dem to Conservative. Liz Lockyear and Roger Smith were members of the Design Committee representing TAAG. November 2014 press release Teignbridge allocates £2.5 million to New Carlton Development. Liz Lockyear and Roger Smith work closely with TDC officers and were on the Project Panel committee. TAAG management expertise, data and visitors numbers were included in grant applications for Coastal Community fund and Arts Council grant. 2014 it is clear that TAAG will not be in Pavilions (New Carlton) and requested a 25 year lease to continue at TAAG Arts and Community Centre site – refused – nominated TAAG building in 2015 as a Community Right to Buy property – now agreed. 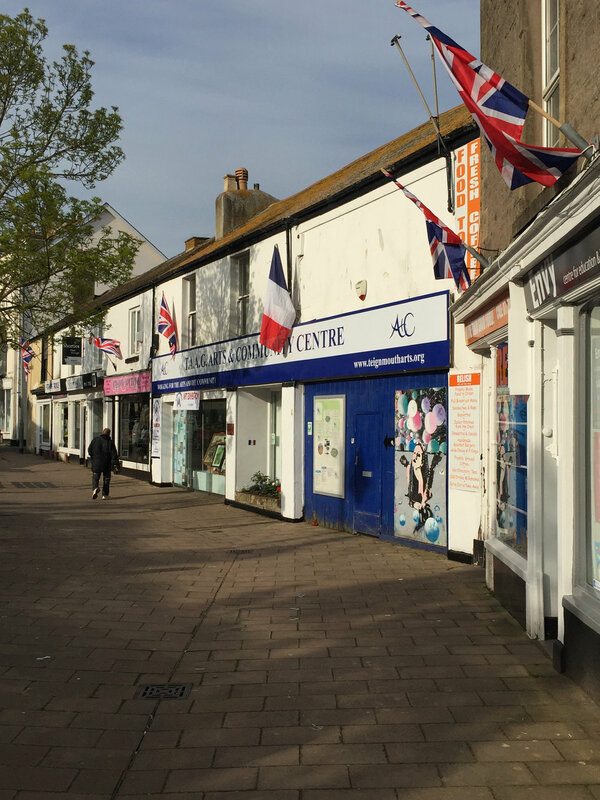 2015 TAAG included in Local Development Order (LDO) with no provision for its future at the same time as the Back Beach Arts Quarter initiative, supported by Teignmouth Town Council, is underway. TAAG has been at the forefront of the strategy for Arts since 2007 when ART ceased to be a statutory requirement by Local Authorities. Accepting that leadership was in our own hands a round robin support system was introduced and by working alongside performance arts, TAAG has been instrumental in making Teignmouth into an ARTS town. The Arts and community Centre is home to the TRAIL (the popular sculpture trail on Teignmouth seafront), RNLI, Information Hub and used regularly by Teignmouth Art Society. There is a wide variety of art workshops, language teaching, book clubs, philosophy etc. There are regular volunteer stewards in place every day from 10am -5pm and extra cover for evening events. Providing family art workshops for Carnival and other events requiring art/crafts. Used by many non-art organisations such as Teign Transition – clothes swap. Two week exhibition in January for 40+ Teignmouth Voluntary Organisations and Societies. Hosts for Biennial International Art Exhibition. Organise community lantern parade for Christmas lights switch on. Hosted opening presentation for Flood defence scheme. Additional rehearsal facilities for the Teignmouth Players. Awarded medals by Russian consortium for participation in the Yuri Gagarin 50th Anniversary. Opening of Devon Open Studios 2015 and 2017. Poetry Festival start up and ongoing venue. The above is just a few of the activities at TAAG which run alongside 32 art exhibitions a year.